Check out our range of fun jellyfish facts for kids. Learn what jellyfish look like, what they eat, where they live and much more. Read on and enjoy a variety of interesting information about jellyfish. Jellyfish live in the sea and are found in all oceans. Some jellyfish live in fresh water. Jellyfish look a little like umbrellas. Jellyfish can be large and brightly colored. They can often be transparent (see-through) or translucent (semi-translucent). 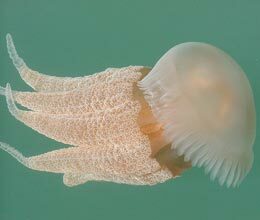 Although the word is mentioned in their name, jellyfish are not fish. A group of jellyfish is called a ‘bloom’, ‘swarm’ or ‘smack’. Large blooms can feature over 100000 jellyfish. Jellyfish use their tentacles to sting. Most are harmless to humans but stings from some species, such as the box jellyfish, can be very painful and sometimes kill. Box jellyfish are almost transparent (see-through). Jellyfish eat plankton. Some sea turtles eat jellyfish.